Christmas time is a synonym of family, happiness and gifts. And this year the gift was especially good for us stargazers. 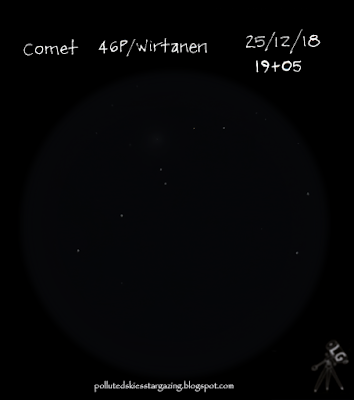 It brought back the comet 46P Wirtanen in a way that could be seen with just our eyes and a decent dark sky. I have to admit that I was very skeptical to the idea that it could be seen with the naked eye because until now, I had never been able to see one of those fuzzy blobs with just my eyes. There was always something in my way: my observation site was close to light pollution sources, there was moon light while the comet was there or simply the comet was too close to the sunset or sunrise. This time was not the exception, the huge redwood trees declared their challenge to see from my backyard. Despite that, the night of the 12th I went out with my 10x50s Up Close binoculars and tried just for luck. What a surprise I had, when I discovered that the area where the comet was supposed to be was right in the middle of two tree tops and the gap between was wide enough to locate the comet. I followed the only two guide stars in my field of view: α Cet and λCet in the tale of the whale and drifted with my eyes to the east, just a couple of degrees left of them. I could clearly see a particular fuzzy blob that I hadn’t see before. It must be the comet, I thought. Greedily. I pointed the binoculars to the spot to confirm it, and I was right. Voila! The comet was there, in the middle of two 3rd magnitude stars : ξTau and οTau in the back of the bull. What a good one! 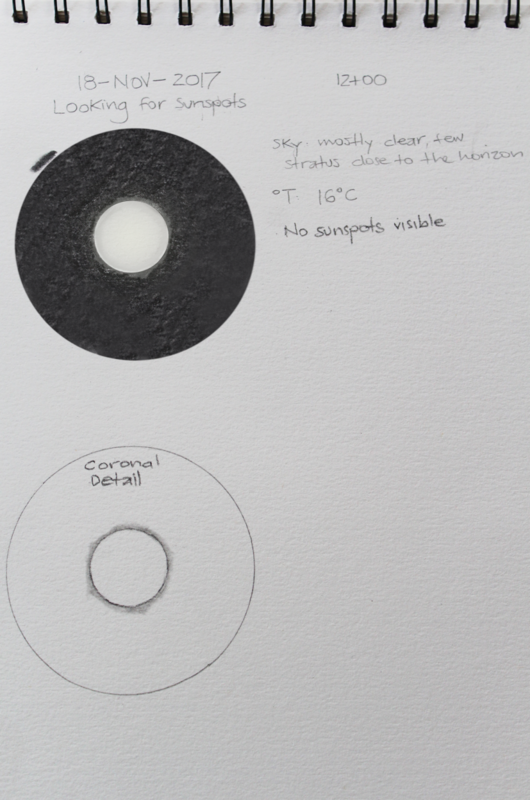 With the moon growing, my chances of seeing the comet again were decreasing, so I had to wait until after the full moon to try to spot it again and then sketch it. Between some cloudy nights and rainy days the 25th arrived with the sky clearing up and as a child on a Christmas morning, I went to look for my gift at night. I took the telescope and some sketching pads and visited a spot a couple of miles from my house where there is more open sky so the chances to trip on a tree top were less. The sky seemed pristine but the abundant rain in the previous days promised to bath my scope as soon as the temperature started to descend. Above me, I could see the milky way showering Cassiopeia and the leftovers of the Cygnus region. I set the scope and checked for the comet. It was supposed to be in the hat of Auriga. Somewhere, between the triangle formed by the stars Capella and the less bright ones Menkalinan and δAur. The constellation was right above the brightest dome of light pollution coming from Silicon Valley so I had trouble seeing the comet with just my eyes. Without a proper star chart, I had to navigate the area with my finderscope and wait until some blob or fuzzy appeared on the scene. It did not take too long till I found it. It had drifted from the center of the triangle towards the NE. By that time, my telescope corrector plate started to show signs of dew so I quickly traced some dots on the paper and in a matter of minutes a raw sketch was done. I wish I could have been more prepared for the dew, but this was what I had at hand and at least I didn’t let the year go without another sketch since I have been very limited with those this year. 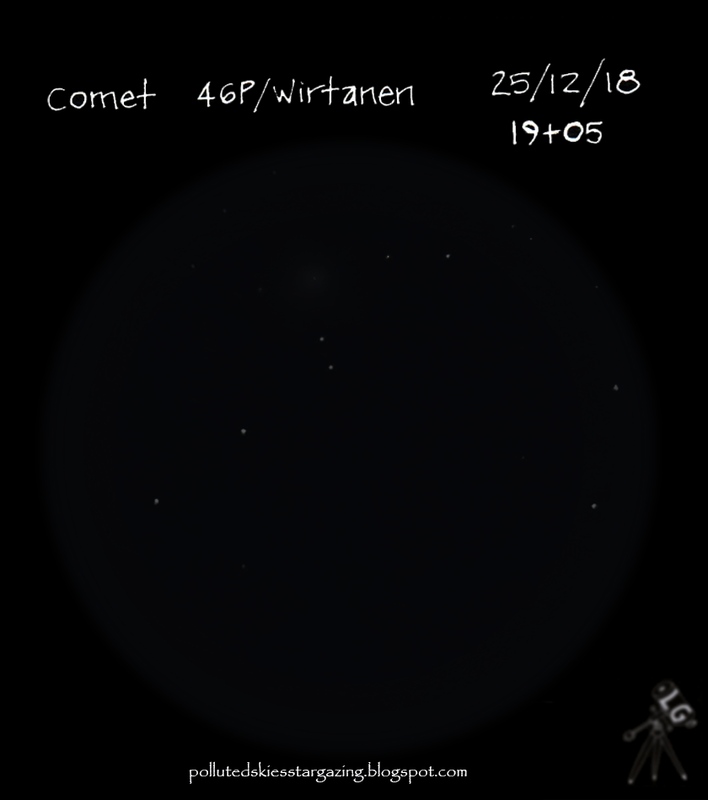 The comet will be in the skies for a while, so if you haven’t see it, grab a pair of binos and go get it. It is there for you! To all my worldwide readers I wish you a Merry Christmas and a Happy and starry 2019 year. There was a long, long period since my last observation and evenmore since my last entry. I guess work has just been sucking my time and energy and also other miscellaneous stuff got me busy. Generally speaking is just a matter of adjusting priorities and catching up with the speed of this new pace of living. A couple of days ago, the sky was begging to see the telescope (even better, the scope was begging to see some light). On a clear, moonless and semi-dark night, Ursa Major was near the zenith and just in the middle of my little piece of sky. 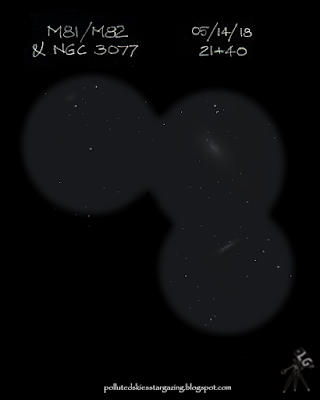 My expectations to see something new were few so I aimed the scope at M81/M82. I thought that the sky would not be dark enough to try a fainter galaxy. I first scanned the area to get to M81/M82 with the finderscope. It was not too hard to reach the spot, but I noticed I was out of practice. Anyways, once I got there, I switched to my 40mm eyepiece (37.5x) and for a while enjoyed the view of this amazing galactic couple. 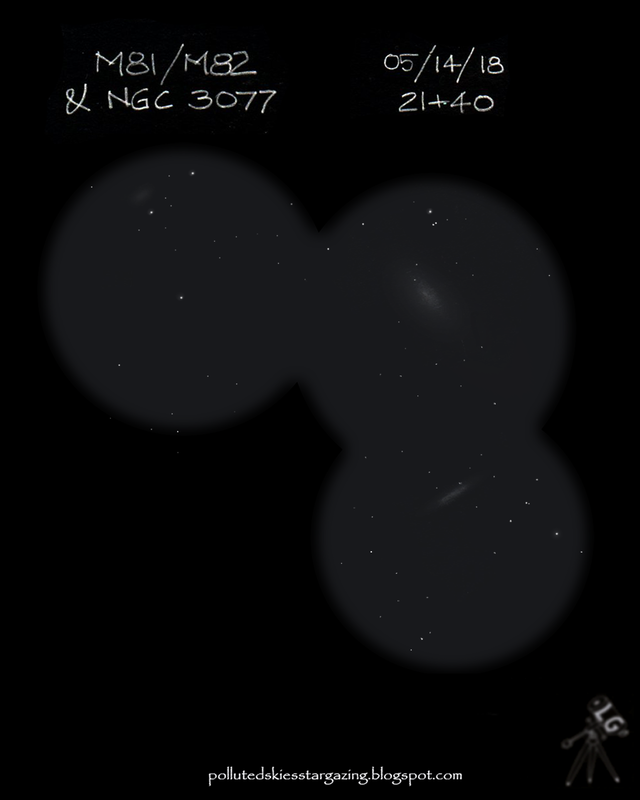 I checked in my tablet to see if there was something around to try for luck and a very close galaxy was near by: NGC3077. I got tired fetching for NGC3077 and then decided to pop up on magnification with my 15mm eyepiece (100x). M81 was more prominent now and the Cigar showed a little more of thread inside the sticky shape. After enjoying those two, I hopped to the triangle formed by the 8th magnitude stars HIP49121A, HIP 49230 and HIP49193. Suddenly, a ghost appeared near by. It was an obvious, but shy nebular patch: NGC3077, part of the several galaxies of the M81 group and I guess one of the very few I could see with my 6” scope under these conditions. Not so much to say about it, but I rather decided it was time to sketch it. Of course, by that time, the area had reached the trees. Yes, I have a small window of sky, so to speak. Well, I have to wait two nights more to complete the sketch using a pre-elaborated stellar “grid” with the brightest stars in the area to save me some time. It worked quite well, despite the curvature that distorts the distances at the eyepiece. So here is the result, and my first sketch of 2018. Still looking for a spot with more sky available and we will see, what else I can get this summer. Due to the last great solar eclipse in America, some of the big renown astronomical companies decided launch new models of solar binoculars and probably many people decided it was a good time to spend their money on a pair. Those models of solar binoculars are exclusively dedicated to solar viewing because they were built on a non-removable solar filter glass in front of the objective lenses. I feel it is a safe way to look at the sun, but also a good way to waste money, especially if one had already owned one or more pair of binoculars. Other than the nice looking glass, there is nothing really special in these binoculars that one can’t achieve by placing a binocular solar filter in front of the objectives. 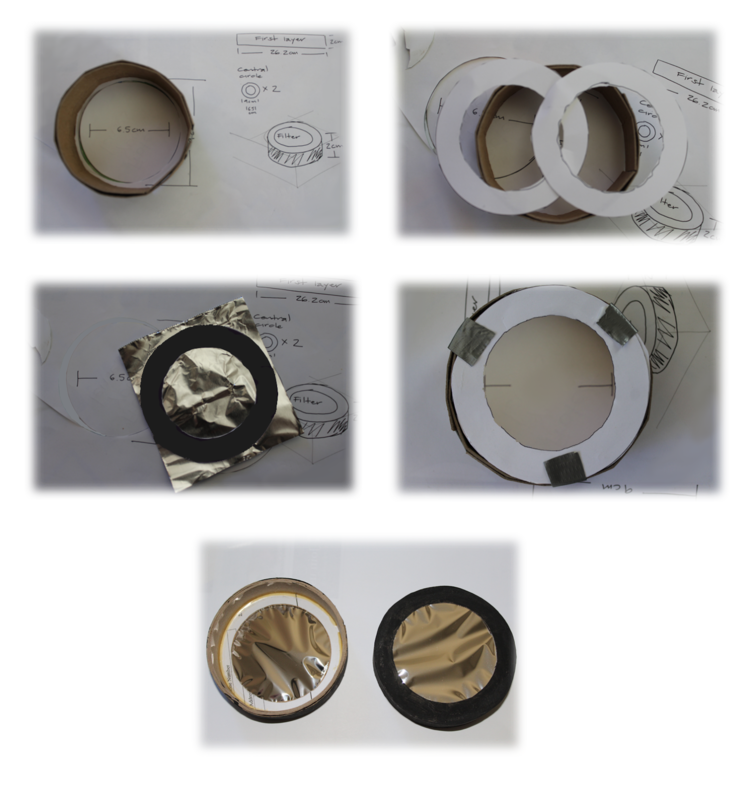 You can buy a dedicated solar filter for your binoculars or you can made a solar filter, using a solar filter film. I chose the second option and for less than 20 US dollars I achieved not only solar filters for my 15x70s binoculars, but also one for my telescope. 1. First and most important: a solar filter sheet. I used a 140mm x 155mm (5.6” x 6.1”) sheet of Baader Solar Film. 2. Cardboard. Choose a cardboard thickness that can easily bend around your binoculars without breaking or folding. The kind of cardboard that comes with the cereal boxes is a good one for small binoculars. 3. Tape. In the picture I put duck tape but for my filters I used blue masking tape. 4. Glue. I strongly recommend wood glue. It glues the cardboard very well, at the same time it fills in the gaps between the different layers. 6. Measuring tape, ruler, pencil, a box cutter, scissors and a drawing compass. 7. Paint and a good paint brush. Be sure you have a little and smooth paint brush. I bought mine in the dollar store and it was a disaster. I ended up using a sponge to paint the cardboard. 8. Your binoculars (or small telescope). 1. Cut about 5-6 cardboard strips of about 2cms wide (or 1 inch). The first one’s length needs to be the circumference (C) of the outer edge of the objective. You can measure the diameter (d) of the exterior edge and use the formula C= πd or measure the C with a soft measure tape. Cut the first strip with the C measure, then the next ones at least 5 cms longer than that. 2. Once you have protected your lens, wrap the C length strip around the objective and use some tape to hold it there. Keep it tight to the objective. 3. Measure the new circumference including the first ring to know and cut the length for the second strip. 4. Put some glue around the strip and use a piece of cardboard to spread it even. There should not be clots of glue, especially close to the edges of the cardboard. 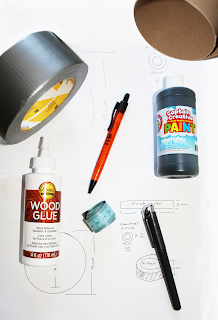 Once you finish spreading the glue, place tight the second strip to the first one. 5. Repeat steps 3 and 4 to add more layers until you have reached a good ring thickness (like in the last picture) then you can paint the inside of the ring. Save one strip for the final step in the Donut Assembly. Special advice on the ring construction: when you add a new layer, be sure to NOT start placing the strip in the same end that the last one. Rotate the strips at least 45 degrees clockwise in relation to the previous one. This will give more strength to the ring. 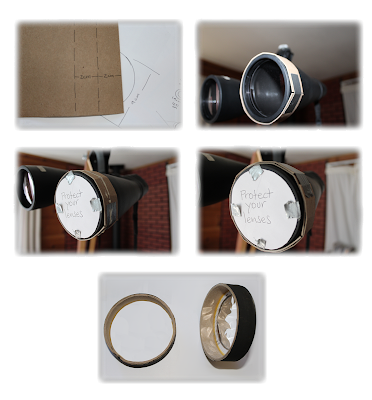 Also be sure to use cardboard think enough to make a good layer thickness, but not so thick that it will fold while you are placing it around the binoculars (like in the picture). 1. With the ring done, you’ll need to make a donut to support and attach the filter. Measure the diameter of the outer edge of the ring. 2. Use that diameter (the ratio, actually) to trace the outer circle of the donut. For the inside circle select the best width for your FOV and your double sided tape. I used 1.5 cm for my donut width giving me an inner diameter of about 5.5 cm or 9” (that is for using with my 7cm or 2” of aperture binoculars). 3. Trace two donuts and cut them out. Be sure they match. Paint the exterior sides. 4. Cut the filter with scissors. Cut a square where the side is the measure of the diameter of the outer circle. 5. Put double sided tape on one of the unpainted sides of one circle and drop it carefully onto the filter, trying to cover the whole donut. Do not stretch the filter and once it touches the double side tape it has to be left that way. 6. Going back to your cardboard ring, put glue on the ring edge and drop the other donut (the one without the filter) on to match the edge of the ring. Then put three strips of tape from the ring to the donut (like in the picture) and put some double side tape in the donut. 7. Cut the corners of the filter sheet off and place it carefully on the other donut. Be sure, you match the borders before dropping it completely. Once it touches the surface of the sticky tape, there is no turning back. 8. Finally, put another strip of cardboard on the ring. 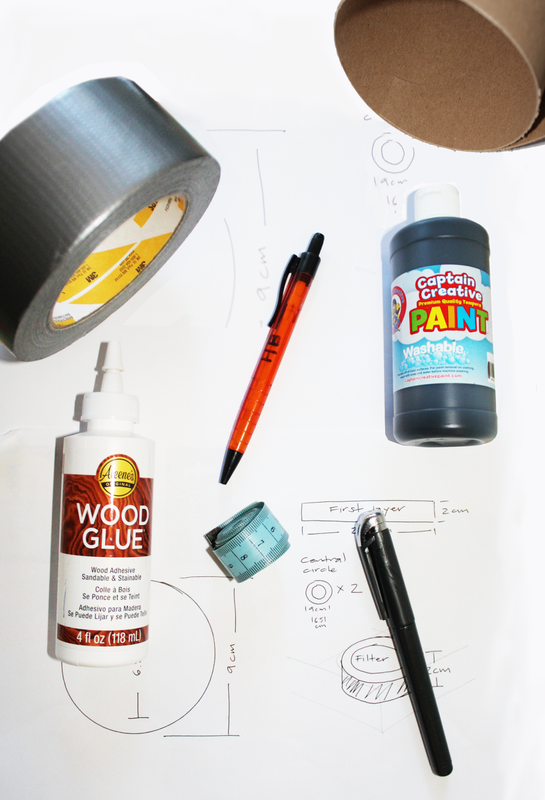 In this way, you make sure the tape won’t slip out and carefully paint the outside of the ring. At this point, carefully avoid touching the filter or dropping paint on it. The filter is complete! You just need to repeat the whole procedure for the other objective unless you are doing both filters at the same time. I built the whole filter first and then painted it, but it is better to paint as it is being constructed to avoid the risk of dropping paint on the filter. With a 15x70 binoculars it is possible to see sunspots. I am not a big fan of solar observation, yet I have seen couple of those amazing earth like size, solar areas. Here is an sketch I made of the Sun (no sunspots where visible though), on the 18th of November on a partially clear morning in the city of Scott’s Valley, CA. 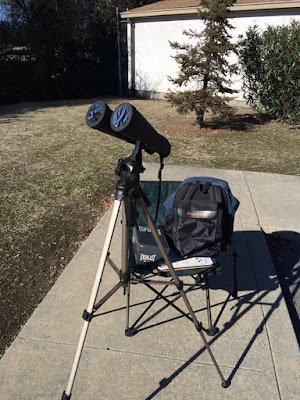 Now, if the sky is giving you some trouble at night, it is time to put some DIY solar filters on your binoculars (or telescope), get a chair and enjoy some solar observation. Copyright 2016 © LuisGabrielCarvajal. Awesome Inc. theme. Theme images by follow777. Powered by Blogger.